5 Great! So... what's wrong with it? 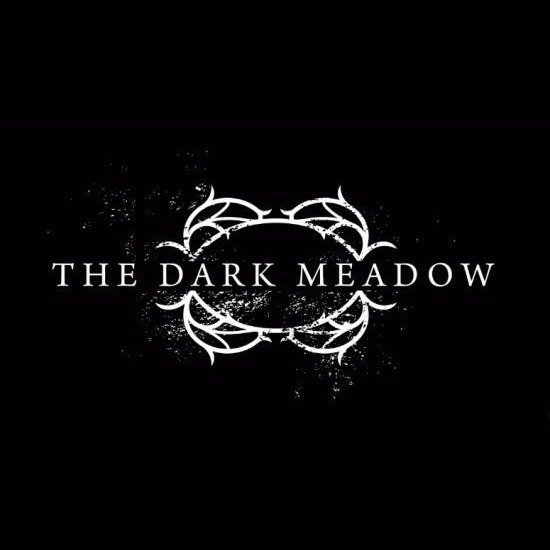 I want to put one thing on the table right away: I'm a huge fan of horror-actions games, so I have been insanely excited for the release of The Dark Meadow: The Pact for at least three months now. 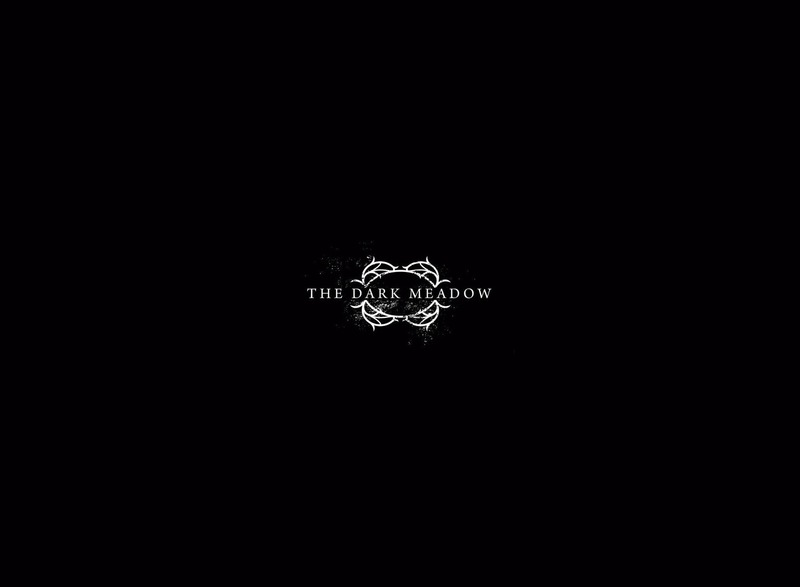 I've watched the trailer at least a few dozen times, read about the game for iOS (yes, this is a port), and done checked out any info I could find that wouldn't give away all the secrets of the game. But, the more anticipation involved, the greater the chance for letdown, no? 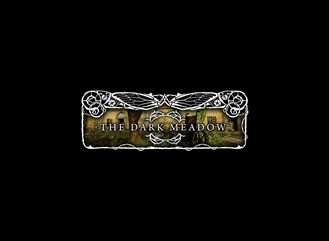 Fortunately, that's not the case with The Dark Meadow - this game is awesome. The game starts off in full-on creepy mode: you wake up in an abandoned, dilapidated hospital with no idea who you are or how you got there; no backstory, nothing. You just find yourself in a nursery (which makes it even more creepy, in my opinion), with a strange man in a wheelchair talking to you. His voice is both psychotic and oddly calming at the same time, which sets the mood perfectly. The man warns you of the creatures dwelling within the halls and makes mention of a "witch" before quickly rolling away never to be seen again (well, I haven't seen him since, anyway). From this point forward, this man plays as a narrator of sorts, using the hospital's intercom system to speak to you. I would freak out and explode if I woke up here. Since the game is set entirely in first person view, you can immediately begin exploring your strange new world, and it makes it all that much easier to really get sucked in. Touching certain items, like bookcases, drawers, cabinets, etc. 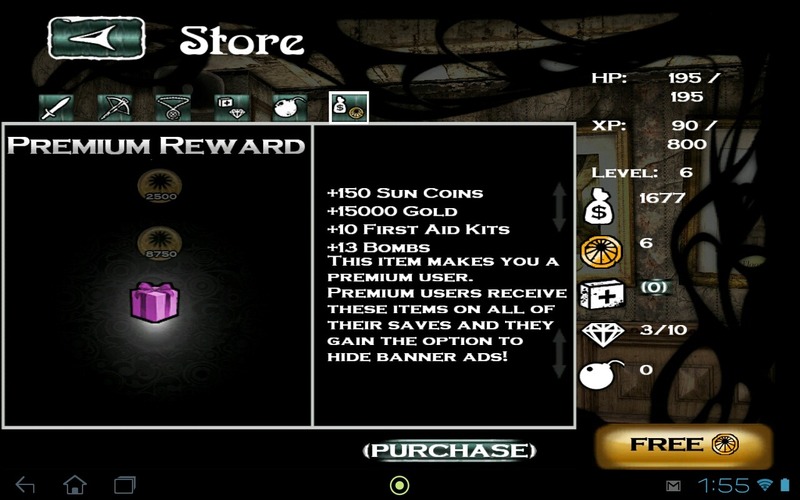 will open them and give you items from within (usually gold, which can be used to buy upgrades - more on that later). I killed him (her?) until ten past dead. To look around, just drag your finger around the screen. The default controls didn't feel all that natural to me here, so I inverted the both the vertical and horizontal axis, which makes them more in line with the way things normally work on a tablet (swiping, etc.). When it comes to battle, the controls are equally as intuitive. You have two different weapons: a crossbow for ranged attacks, and a shiv/sword/sharp thingy for melee attacks. 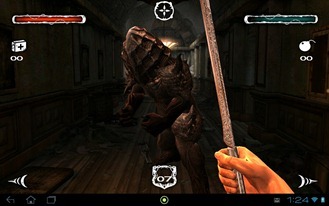 When a creature spawns in front of you, the crossbow automatically comes out and you tap the spiral icon to aim and release to fire. The mechanics here could be very frustrating (as with many other games), but they're not, at all. Aiming with the crossbow works exactly as it should. 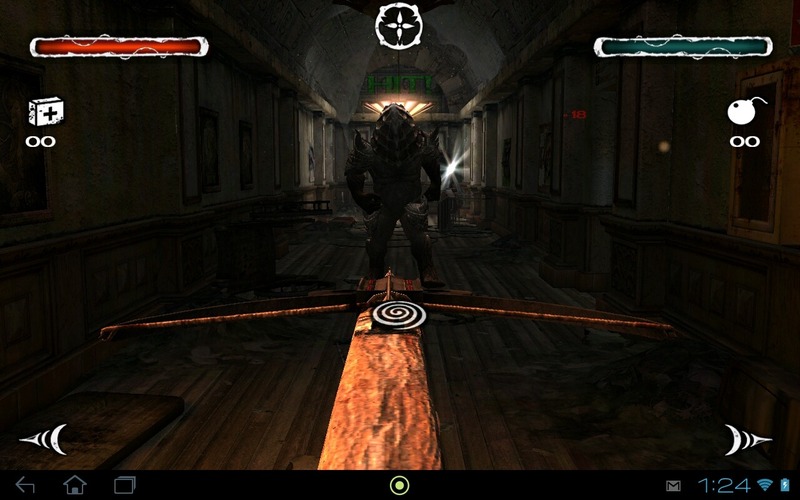 Have you played Fruit Ninja? If so, you're already ready to handle melee attacks. Well, basically, anyway. 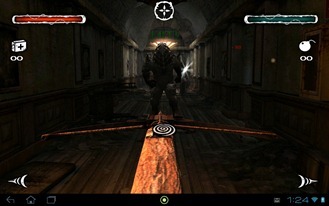 There are arrows on either side of the screen that let you dodge the creatures' attacks, and you swipe to attack (which is where the Fruit Ninja expertise comes into play). It works quite well - just make sure to dodge in the appropriate direction. 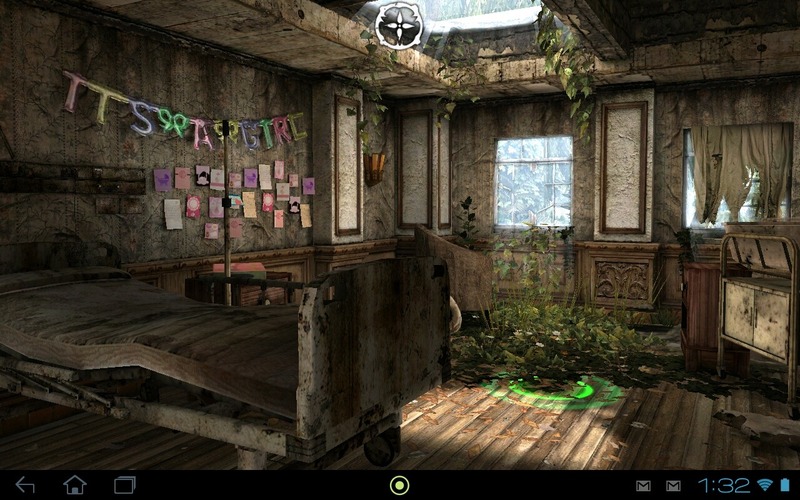 The power of the Tegra 3 is prominently displayed here - just look at the difference in the screenshots above. The textures are much more rich and vibrant on T3 devices; the environment really comes to life thanks to the NVIDIA's 4-plus-1 architecture (four regular cores, one battery-saving efficiency core). These added elements make the game that much more realistic feeling and really shows the age and abandonment of the hospital. Since this is an action-style game and you have weapons, there has to be a way to increase the power of your weapon, right? This is where the gold that I mentioned earlier comes into play. 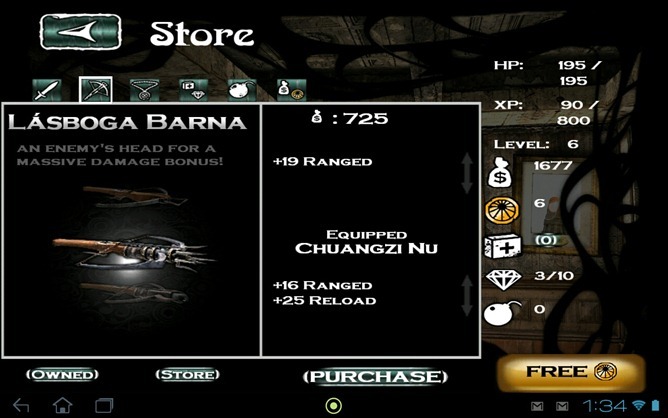 You can enter the 'store' from the menu, where you'll be able to purchase new weapons (crossbows and swords), as well as amulets that can increase your health, defense, etc. 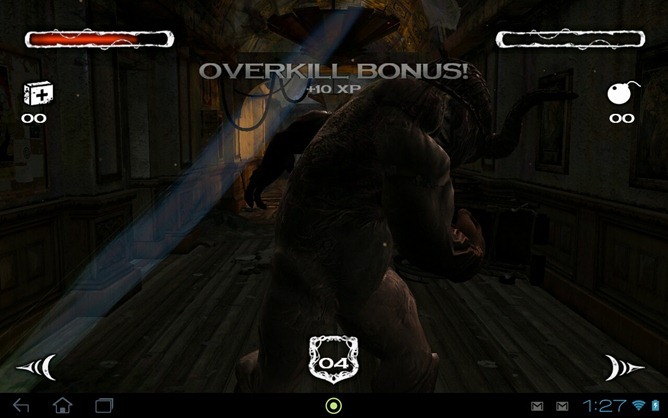 As you level up (killing creatures gives experience) you also get "skill points" that can be used to increase your vitals: health, defense, block, melee, ranged, and reload. 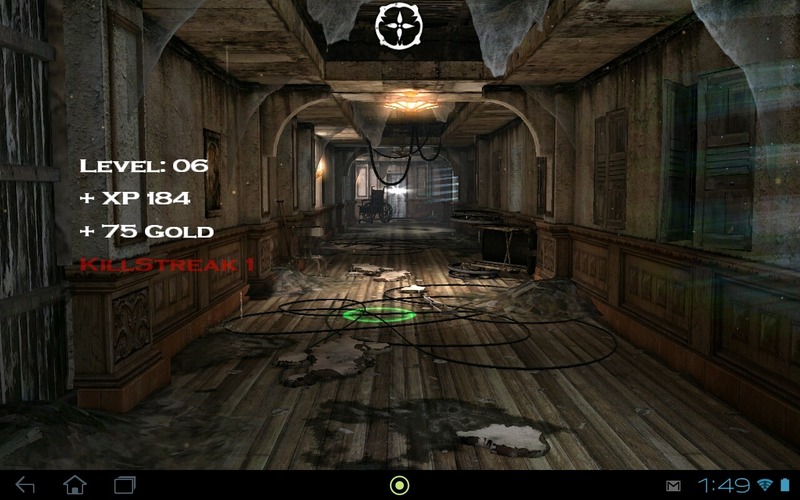 You'll need to increase these to defeat bosses and access areas of the hospital where stronger creatures live. And then there's the "pay real money for this stuff" stuff. 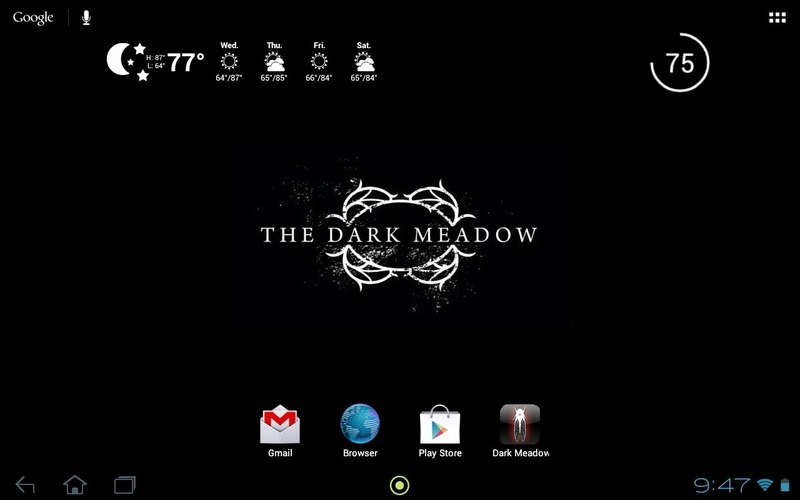 Like most games now, The Dark Meadow has in-app purchases that will let you get through the game a bit easier. This includes things like gold, sun coins, gems, etc. - all of which are used to buff your character as much as possible, as well as buy first aid kits and bombs (which slay enemies much faster). 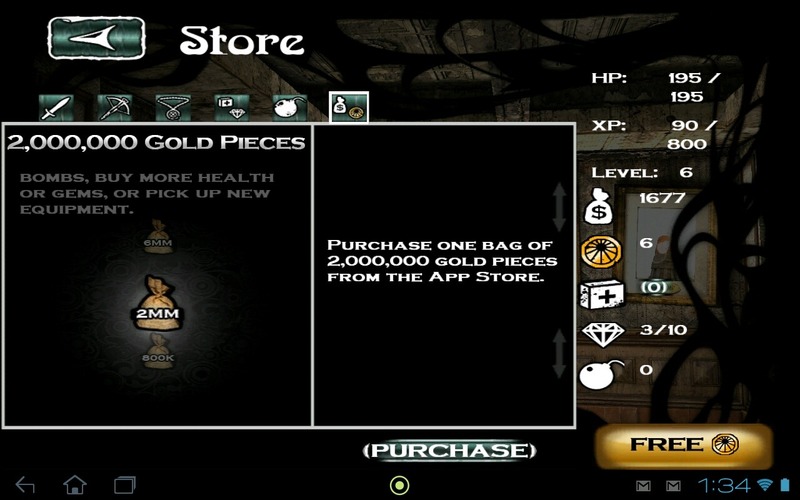 Fortunately, the game is quite playable without ever having to buy anything. App Store, huh Phospher? I think you need to check your store names again. Great! So... what's wrong with it? I think the biggest issue with this game is that it's lacking a clear objective in the beginning. There are no quests, no hints on what you should be doing, nothing of the sort. I figure that you're supposed to walk around exploring rooms and battling creatures until you're strong enough to handle the boss battles (the first of which is the mysterious white witch from the very beginning sequence) and make your way into other areas of the hospital. I'm not necessarily saying that's a bad thing, per se, just... slightly confusing. I actually enjoy the freedom of walking around and discovering new artifacts in the game, as well as battling the random creepy creatures and listening to the crazy old man's banter. Yep, that's my tablet's homescreen. Loving this game. 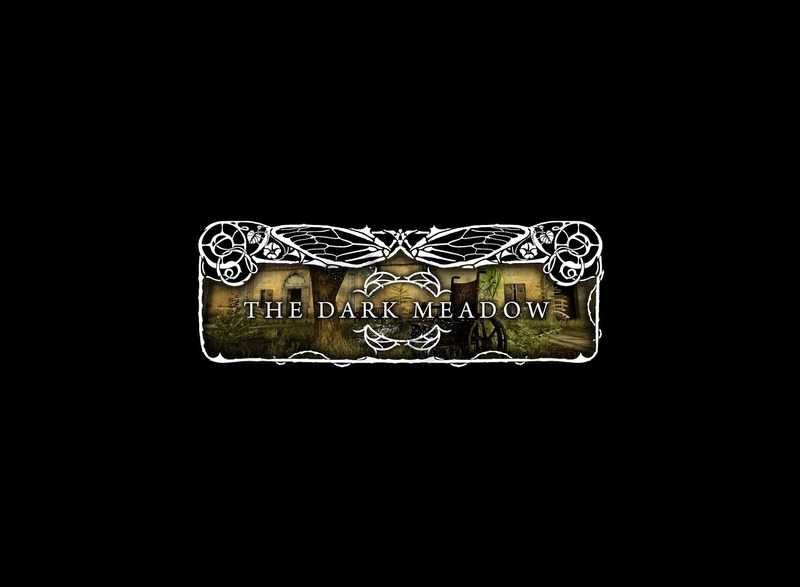 After spending a couple of days playing The Dark Meadow, I can honestly say that it has lived up to my expectations in many ways, and surpassed them in others. 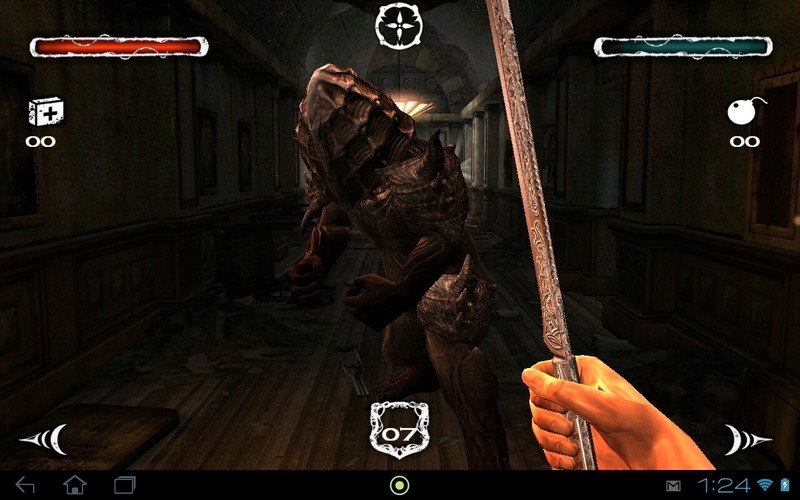 It's creepy, mysterious, and fun to play; the touch controls are outstanding and an absolute pleasure to use, and it is challenging enough to keep me going with enough mystery to keep me hooked. Now, if you'll excuse me, I have to go kill that witch so I can see what's happening on the second floor of the hospital.